Samsung X60 high performance notebook computer for professional laptop users and features Intel Core Duo processor, integrated Wireless networking, integrated Bluetooth connectivity, 2 DDR2 SoDIMM slots, ATI MobilityTM Radeon graphic chipset, PCI-Express Gigabit LAN and runs on Microsoft Windows XP. The laptop comes with a recovery CD or recovery partition. TrustedReviews reviews Samsung X60 and concludes with overall rating of 8 out of 10 that “Samsung X60 is a very good notebook, that’s undeniable. Despite not being as fast as competing products, unless you’re in the habit of running seriously hardware intensive applications, the X60 will be more than a match for anything you’re likely to throw at it. However, the battery life does concern me and I would have expected better from this machine. Specification wise, you’re getting pretty much everything that you could want along with good design and a solid build quality. The screen is particularly good and at a push the X60 could even fulfill your gaming needs. 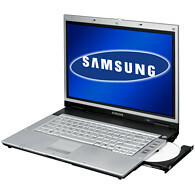 Check out review of Samsung NP-X60 by NotebookReview.